I thought I'd be able to relax a little once we got home. Au contraire my friend, it's been non-stop ever since we got back. So what have we been up to?... Well, appointments mostly. The day after we got home, Elijah saw his Physiatrist, Dr. Nice Guy (for those of you new to my blog, I like to nickname our doctors.). He, of course, was pleased to see all the new things Elijah is doing. I don't think Dr. Nice Guy remembered that he told us he didn't think Elijah would be walking by the time this appointment rolled around. I was nice and I didn't bring it up either. J The main thing we wanted to talk to Dr. Nice Guy about was the foot orthotics called SureStep. He told us that he really didn't think that Elijah needed the braces. His reasoning? Since Elijah hasn't been walking very long, the doc wanted to give him more of a chance to grow and develop before putting Elijah in braces. "I think he'll improve with or without braces," he said. Since Elijah has only been walking a short time, he thought that walking on uneven surfaces would improve the strength in his feet. We pushed back, showed him the pictures our PT in Madison had taken, and he still wasn't convinced. He thought it would be best to wait a bit and reevaluate within a few months. "He's made some wonderful progress," he said – and seemed to think that Elijah will continue progressing without braces. On Thursday we went to Shriners Hospital and – waited – for an hour and a half before we were seen by anyone. I was actually amazed at how well Elijah handled the wait (the pic is from the waiting room). One of the nurses told us that in her eleven years working there, she'd never heard of anyone waiting that long and we reminded ourselves that while nothing is free, Shriners operates at no cost to us. Anyway, after the wait, we were able to meet with a team of specialists and I think that the appointment was worthwhile. Their OT gave me some specialized bowls and a spoon that would make it easier for Elijah to feed himself. We also asked for a third opinion on the Surestep and they agreed with Dr. Nice Guy…they thought Elijah was young and that walking would strengthen his feet. Their opinion was to wait on braces until he was walking for a longer period of time (so the Surestep debate continues). Elijah had a speech evaluation at the end of the week we got back. 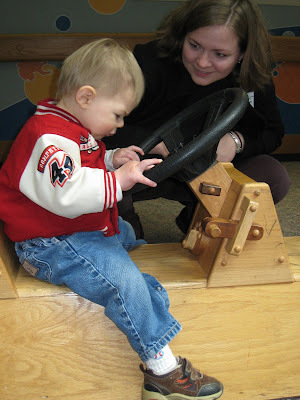 I was pleased to have someone finally say that they thought Elijah needed speech therapy. So far, we'd been told that Elijah wouldn't get or need speech therapy until he was two. It was frustrating to say the least. Anyway, after seeing such fantastic improvements in Elijah during his month of therapy (which included an hour of speech therapy every day) we were anxious to find someone to work with Elijah. I know I asked the right questions this time around, but I shouldn't have to ask the right questions. Isn't that the therapist's expertise? Shouldn't a speech therapist notice that he constantly drools, doesn't have any words, and doesn't have any expressive language really? Shouldn't that warrant regular therapy? The last therapist was a really nice lady and I liked her. But, she told me that she didn't need to see Elijah for three to four months. What? I don't get it. After seeing what a month of therapy can do for our little guy, I'm sold on the effectiveness of regular therapy. Do these people know how much I ache to hear my little boy's voice? Anyway, I digress. This therapist agreed that Elijah would benefit from therapy and I'm happy to say that he'll be getting speech two days a week starting at the end of this month. So, it seems my life just got a little crazier, but I definitely think it's worth it. We've met with both Elijah's clinic and school therapists. It's good to be back and nice to get back into a routine. I think that they're all happy to see how well Elijah is doing.